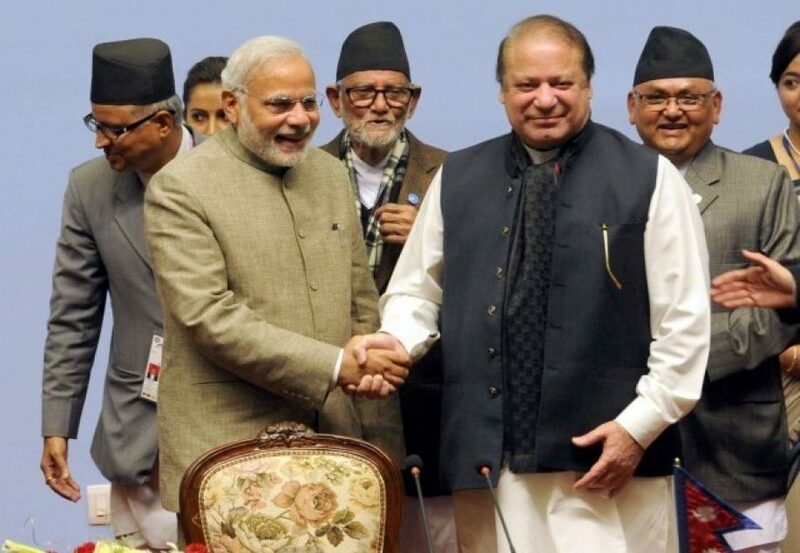 The 18th Saarc Summit was saved from being declared as an utter failure by one small gesture—a handshake between Prime Ministers Nawaz Sharif and Narendra Modi. The entire hall stood up in standing ovation and the two, perhaps noticing the jubilation, had to keep holding each other’s hands for some time. Nawaz extended his other hand to Afghanistan’s newly elected President Ashraf Ghani. The trio raised their clenched hands in air to respond to the intense capping. It all looked touching. As if the happiness of the one sixth of humanity that lives in South Asia hinged on this symbolic gesture. As if other Saarc members had heaved a sigh of relief hoping that this might release them from the curse of Indo-Pak rivalry that keeps their development hostage. Perhaps it was simply an outburst of two days’ tension caused by constant bad news. Not that anybody nurtured any high hopes from this Summit. It was clear from the word go that Pakistan would not initiate for peace after India’s unilateral cancellation of foreign secretaries’ talks. And India was not willing to retreat or, in the words of Pakistani official, “bite the dust” after its harsh stance. Yet the grim expressions shown by Nawaz Sharif and Nerndra Modi in the opening ceremony added to the tension. The Indian media that monopolises Nepal’s mini screen went haywire showing how macho was Modi. They replayed time and again where Modi did not care to even look at Nawaz Sharif while he passed by. One channel almost warned that if Nawaz tried the Mush trick by offering surprise handshake to Modi he would get a befitting response. The punchline was: Modi is a sharp shooter and no Vajpayee. Modi’s speech raised the ante further. Nawaz made an effort to confine himself to regional issues and not to vitiate the atmosphere any further. Modi sounded patronising and delivered a speech as a school teacher talks to students. There was too much of what I-Me-India would like to give Saarc ‘baby brothers’ only if they listened to his Pied-piper speech. It was ironic to listen to Modi’s grand vision about the Saarc, considering that it was because of his aggressive posturing against Pakistan that the regional organisation was not likely to progress further. But the Indian media was quick to give, well, a funny twist to his speech. Many channels interpreted that this was Modi’s grand move to isolate Pakistan as he intended to take the Saarc way forward even without Pakistan. “You might as well call it Modaarc,” I could not resist saying when pushed by a known anchor in a talk show. Who stops India from improving its business relations with the rest of its neighbors. Frankly, this has not happened in the last 60 years and is not likely to happen quickly no matter how you may apply Modinomics. he had given a go-ahead for Saarc progress with or without Pakistan. Sartaj Aziz was quick to welcome Modi’s big-brother role only “if India also starts behaving magnanimously as a big brother. The crux was: Act as Modi the magnanimous, not Modi the bully. All of this had other Saarc members worried, particularly Nepal. The hosts wanted at least a semblance of success to show off. There was no possibility of any structured Indo-Pak talks. But this did not stop journalists from checking every politician or bureaucrat that they could get hold of. Many suspected that there might be a Vajpayee moment; others were looking for a mere breaking of the ice. Even the three agreements on regional connectivity on energy, roads and railways looked in doldrums. The only possibility was an agreement on energy connectivity. But when Pakistan removed its objections, India raised its own, tying the signing of one with the other two. Either all of them or none! This got the Nepalese panicked. We could see the topi-wearing Nepalese running around in desperation. Thankfully, everybody agreed on the energy agreement. Finally, the ice broke at the retreat. There was hardly any choice for Nawaz and Modi who, along with other Saarc, leaders for locked up for over four hours. Nawaz Sharif confirmed that they shook hands first at the retreat and also exchanged pleasantries like decent people. “What else could we do; after all we are responsible adults; if our secretaries are not talking that does not mean we can’t say hello to each other; we can’t act like children and turn our faces the other way.” But he clarified that this does not change the Pak-India reality. Pakistan’s position remains the same that it will be India that will make the first move. We are told the Nepalese, backed by the Afghans and Sri Lankans, also helped ease up the atmosphere. We asked lots of questions to Prime Minister Nawaz on the plane? What is the future of talks with India? Does his chat with amount to a Saarc success? Will there be a follow up on this? He parried most questions by merely reiterating Pakistan’s position, saying, “only time will tell.” Yeah! only time will tell.